Photo courtesy of St. Mary’s County Public Information Office. 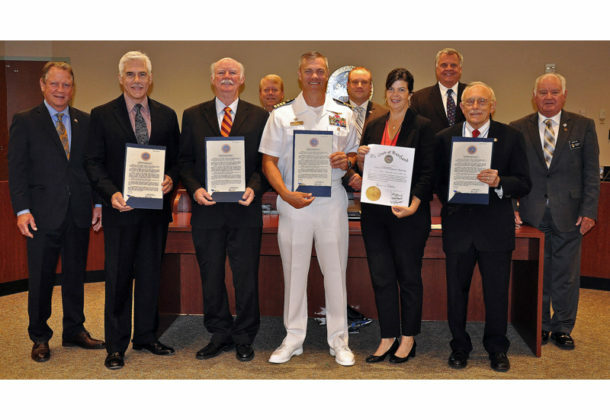 The Commissioners of St. Mary’s County have issued a proclamation to recognize National Aviation Day, an annual celebration set for Aug. 19 each year. President Franklin Roosevelt proclaimed the first one in 1939 to celebrate the history and development of the aviation industry in the US. Patuxent River Naval Air Station, the largest employer in St. Mary’s County, is at the forefront of offering readiness for development, research, testing and evaluation, engineering, acquisition, and fleet support to the entire range of manned and unmanned naval aircraft, avionics, engines, aircraft support systems and ship/shore/air operations. Expanding the dreams of the aviators of tomorrow, the Young Eagles hosted a successful Young Eagle’s rally on June 6 by providing free plane rides to local young people. To honor the contributions of St. Mary’s County and the Navy to aviation history, the new Naval Air Museum & Visitors Center has opened and provides opportunities for visitors to see the evolution of US naval aviation history. Exhibits include naval aviation’s technology history, vital hands-on and interactive demonstrations of the aeronautical sciences, and simulators. Gretchen Hardman, Southern Maryland intergovernmental representative for Gov. Larry Hogan, read a National Aviation Day citation from the governor at the commissioners’ meeting. By recognizing Aug. 19 as National Aviation Day, the Commissioners of St. Mary’s County express their appreciation to the St. Mary’s County Airport Advisory Committee for its volunteer efforts during the past year. The commissioners also encourage citizens to become interested in and to take advantage of opportunities in aviation and related activities.